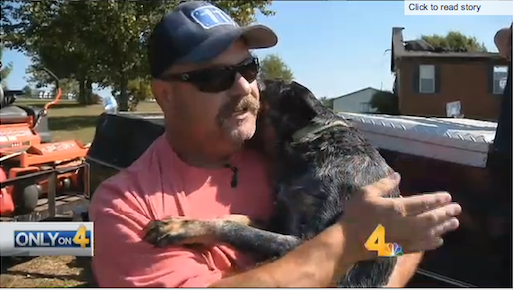 The man who ran into a burning house to save a dog moments before the roof collapsed met the dog’s owners Monday. As a home in White House burned to the ground Saturday, neighbors knew a dog was trapped inside. They watched as a mystery man drove up in a Mustang and ran inside. A few minutes later, the man exited the house carrying the 80-pound dog in a blanket. The dog, Sampson, was unhurt. The good Samaritan disappeared. “He got in his car and left,” a witness told Channel 4. The man in the Mustang was Tim Tawater, a 20-year veteran of the Nashville Fire Department and a self-professed dog lover. Tawater lives in White House. He was off-duty Saturday and on his way to his daughter’s birthday party. “We just live two or three miles from here,” Tawater said. He saw the smoke and knew the volunteer firefighters wouldn’t be there for a while. “I don’t do it for people to say ‘thank you.’ I do it because it needs to be done,” Tawater said. The homeowners are Brandon and April Gorley. They had just arrived in Gulf Shores when they got a call that their house was on fire. They turned around and came home. Monday, they met the man who rescued their beloved Sampson. Sampson is a Bouvier, a type of German herding dog. At 82 pounds, he is only half grown. The Gorleys said they were very grateful for Tawater’s actions. A relative was house-sitting and had just left to go to the store when the fire broke out. Sampson’s owners joked that he had just gone to the groomer Friday, so he had a nice hairdo for his TV debut. Does he wear a cape and a mask? No. Can he fly and have super powers? No. But by every other definition, this man is a super hero. Guy didn’t need to be called upon, because he’s always forever watching over the people of Tennessee. When a life needs saving, you can rest assure Tim Tawater is already in his batmobile Mustang racing over to save those In need. And as fast as he arrived, he leaves knowing that all lives are safe, and he races off in his mustang to his daughters birthday party/saving any one else who needs saving. He doesn’t see a difference between a man and canine or any other animal. If it lives in a house, it needs saving when its home is set ablaze because he knows that dogs like Sampson is family. He doesn’t do it to be featured in the papers, he does it because it needs to be done. He’s a silent guardian. A watchful protector. He is Tim Tawater. This entry was posted in Uncategorized and tagged batman, Dark knight, gaurdian, Hero, Protector, tennessee, Tim Tawater, watchful gaurdian, White house on October 19, 2015 by edlee. Ex Navy SEAL shows Captain America Chris Evans His Captain America Fake Ball Tribute.